Absolutely amazing pdf full of magical weather to enhance your games - sequel please?? 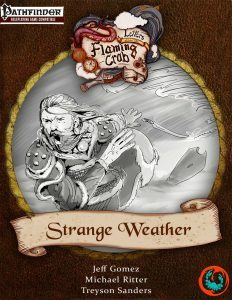 This installment of Flaming Crab Games’ neat series of oddball pdfs clocks in at 16 pages, 1 page front cover, 1 page editorial, 2 pages of SRD, leaving us with 12 pages of content, so let’s take a look! We begin this installment of the series, as always, with one of the charming introductions of the meta-narrative, wherein line developer J Gray salvages letters from the planes-hopping vessel UCS Flaming Crab before diving into the strange weather herein. We begin with simple acid rain before we are introduced to the aurora hypnosis, a fascinating, Wisdom draining aurora borealis that is just awesome. Speaking of which – the Ball Lightning. 4 different types of ball lightning, from CR 1 to 9 can be found, all with diameters, duration, speed, save DCs, damage and explosion radius – you can make those cool lightning balls rolling around the battlefield with this. Do you want something, dare I say, more biblical? May I introduce the frickin bloodstorm that can cause no less than 6 diseases, from dysentery to scarlet leprosy and typhoid fever? Yeah, now THAT spells “sh** got real!” when the BBEG is getting the better of the heroes! Have I mentioned the fact that they may contain blood hail?? What about the Constitution damaging ectoplasmic storms that escalate fear conditions on failed saves? Have I mentioned the TORNADO OF FIRE?? Fire, ash, intensified wind – all amazing. Heat damage! Catching Fire! Smoke Inhalation! Being sucked in! Spawning secondary fires! This is a all-inclusive buffet of awesome, delicious pain to visit upon the PCS! More mundane hailstorms can be found. Oh, and there would be moons! Blood Moons enhance bleeding and lock lycanthropes in their shapes; dread moons and their counterpart, radiant moons, enhance pacts made with the entities of the dark or light, with each phase of a moon enhancing the effects on creatures. And be calmed – you don’t have to track either of those lunar phenomena. If you’re an allergic like yours truly, the massive pollen storms of fantastic flora obscures sight, detracts from flying and can have really nasty repercussions for those caught in it. Oh, and the layers and layers upon pollen? That makes for some really flammable material…Have I mentioned the massive skyquakes?? The power-boon solar eclipses may grant? Yeah, amazeballs!! The pdf also contains a new creature-type, the storm elemental, which not only receives progressively better harsh winds, we get iterations from CR 1 to 11 and 4 variants, from blizzard to dust storm and hurricane storm elementals, these modifications span the CR rates from +2 to +4. The pdf also contains two different archetypes, the first of which would be the stormcaller shaman, who receives a replacement bonus spell array. 3 + Cha-mod times per day, these guys may call forth a tempest as a standard action. The archetype knows one of these at first level, +1 at 4th level and every 4 levels afterwards and at these levels, they also increase range. Firestorms, caustic storms, etc. – pretty cool. It should be notes that the governing attribute for the DC is Wisdom. The archetype loses spirit for this option of AoE-damage/terrain control. The archetype also receives access to 5 unique hexes, from wind stance to walking through sleet and rain and generating an eye of the storm, this is neat. 10th level nets a better supernatural control weather and the capstone is, alas, a somewhat lame apotheosis. Editing and formatting are top-notch, I noticed no significant glitches. Layout adheres to Flaming Crab Games’ two-column full-color standard with a nice blend of amazing original b/w-pieces and thematically fitting stock art. The pdf comes fully bookmarked for your convenience. Jeff Gomez, Michael Ritter and Treyson Sanders deliver one phenomenal installment of this series. Frankly, we do not have enough amazing hazards. Go ahead. I challenge you to name 10 good hazard books. Yeah. We have a ton of class options, but cool environmental effects to throw into our combats to make them more memorable? That’s rare. The strange weather contained herein is absolutely inspired – the deadly effects, the evocative visuals…I absolutely adore this pdf. This is such a great one-stop shop pdf to get some amazing, magical environmental effect to enhance pretty much every game. PCs down on their luck, almost certain to fail? Perhaps a radiant moon’s on the rise! Bored in an overland track? FIRE-TORNADO. Need to drive home that they better stop that villain NOW? Rain some diseased blood upon their heads! I’m celebrating this pdf hard! I adore this. I love it. I’m using the living hell out of it and wish this was a 200-page tome. The archetypes are pretty cool as well, though they fall slightly behind in awesomeness of the main meat. But who cares? At this low price-point, we get amazing, cool pdf that will enhance pretty much every game. This belongs in the toolbox of GMs. Amazing. 5 stars + seal of approval + candidate for my Top ten of 2016. This humble pdf deserves to been seen, used and celebrated!! You can get this amazing little pdf here on OBS!